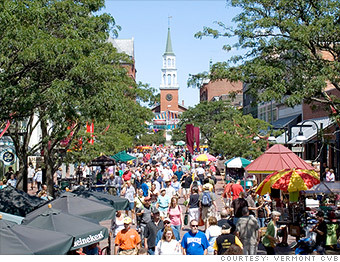 For entrepreneurs serious about keeping a work-life balance, Vermont may be the ideal place to get started. When hard-charging founders need a break from the stressful startup life, they can relax at their pick of beautiful hiking and biking trails, numerous camp sites or any of 60 golf courses sprinkled throughout the state. Or they can dream of growing big, like Ben & Jerry's, Green Mountain Coffee and Vermont Teddy Bear Company, all of which got their start here. Vermont's rich venture capital network combined with availability of low-cost small business loans has been attracting technology, biotech and life science startups, said Betsy Bishop, president of Vermont's Chamber of Commerce. Patent-rich Vermont takes its growing entrepreneurial community seriously. This year, the state passed a law cracking down on so-called "patent trolls" who make money not by creating products themselves, but by pursuing dubious infringement claims against businesses that supposedly encroach on their patents. Source: 2013 Kauffman Index of Entrepreneurial Activity, published by the Kauffman Foundation. The 2012 startup rate for each state is based on a yearly national survey of about half a million people -- adults aged 20 to 64 who start a business each month with 15 or more hours worked. In Montana, for example, Kauffman found that 530 of every 100,000 adults started businesses in 2012.